We walk out to the elephant’s enclosure under the lidless eye of a full moon. Puffs of dust stir around my feet, pale little clouds that settle to the ground. The scent of sand and dung layers a gritty, farmyard taste at the back of my throat. Soft rustles in the waist-high grass are unseen snakes or mice or birds. Moist as a swamp cooler, musty and bacterial, the night air condenses into cold pools and sends my fingers into my pockets. Warm air under the trees brings them out again. My vision is elemental, full of shapes without fine details. As I walk, shifting slabs of moonglow keep rearranging trees as if they are pieces on a giant pearled chessboard, their trunks whitewashed the color of ash. The elephant’s enclosure is hidden in the bush, around a few bends in the road and down a dusty path, out of view for the guests at Stanley’s Camp. The enclosure consists of two heavy cables strung high and low through seven-foot wooden posts set in concrete. A second, lighter wire is suspended outside the periphery. Cowbells dangle from it, an early-warning system for invaders or escapees. Granted, an elephant could bust out of (or into) this enclosure in less than a minute. It’s more of a security blanket for the Trio, a protected space for eating and sleeping. Just ahead a huge smudge of charcoal broadens. Hushed and gaping, tugged like a blank comet into an immense gravitational presence, I orbit a little to the left in a cautious arc. With a low throaty rumble MmmmRRRRRrrrrrr, his own elephant greeting, Doug slips under her jaw and stands by her side. Glasses on his face are two mirrored moons. He reaches up and strokes the skin just in front of her ear. She nods Yes. 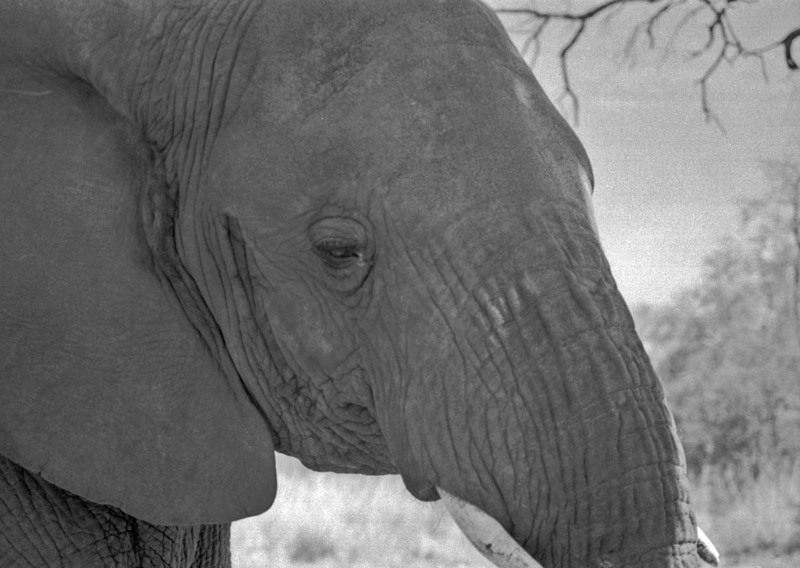 Later I will learn Thembi always nods Yes at the word “pretty.” But she is a beautiful elephant, all her proportions flawless. And Thembi knows she is pretty. She holds herself perfectly still in half-profile, the way beautiful women do all over the world when under regard by an admiring eye.